In addition to spreading the word about how Claritin is helping her allergies, America’s sweetheart, Lori Loughlin, lets us in on her beauty and fitness secrets and why she can’t get enough of American Idol. FUSN: You sound great, so the Claritin must be working. LL: (laughing) The Claritin is working. FUSN: How long have you had allergies? LL: Since I was a kid. It was really in my early teens I realized I had allergies—that was why every Spring I couldn’t breathe and my nose was stuffy and my eyes were watery. FUSN: You travel a lot for your career, do your allergies act differently in different climates? LL: Spring is the worst time for me. There are times throughout the year that I have bouts with allergies and sometimes when I’m around certain animals I like cats and horses, then I’ll take Claritin. 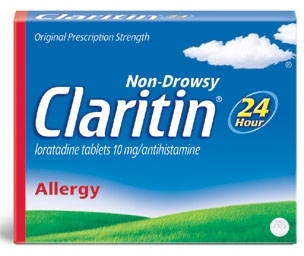 It really really helps and what was appealing to me when Claritin came to me for the “Clear to Drive” campaign was that it relieves your allergy symptoms without making you drowsy. Living in Los Angeles, I’m driving all the time and I have young children I’m constantly shuttling around as well as their friends, so I need to make sure I get relief from my allergy symptoms and at the same time I am feeling like myself and able to drive a car. FUSN: What did you try before? LL: Different various allergy medicines, but I just found that Claritin is the one that works for me. FUSN: Did the other medications have side effects? LL: I had one experience where I was taking an allergy medication and it just made me extremely tired to the point where I thought I was suffering from some virus like Epstein Bar. I really thought I was sick, then a friend of mine came over and asked me if I was taking anything that might make me sleepy and when she read the box, it said right on there that it may cause drowsiness. I was so relieved. The other message Claritin is trying to get out is how imperative it is to read the labels on allergy medicines because the warnings are right there, so it’s important to be aware and have the information and to know what you’re taking. FUSN: Since allergies can be hereditary, do any of your kids suffer from them too? LL: My 9-year old daughter has allergies and she takes the Claritin for children. FUSN: Ok, so we know Claritin is working for you, but you must have some other secret because you have not aged a bit. LL: The key for me is everything truly in moderation. I try to exercise, I’m pretty good about that—it enhances my mood and I’m just in a better place emotionally as well as physically. I try to eat right—I just notice that when I’m putting the right foods into my body I’m definitely feeling better and more energetic, not to say that I don’t occasionally have cookies or potato chips or something like that, but I really do my best to watch what I put into my body. FUSN: Getting back to exercising, what kind of workouts do you do? LL: I do a treadmill class with some free weights about 3-4 times a week. And one workout I’ve been doing since my early 20’s is pilates and I also do yoga. FUSN: And your skin just looks amazing—you do not have one wrinkle on your face. LL: I’m a big believer in sunscreen. I wear sunscreen and hats but I’ve definitely done sun damage to my face because when I was younger I was not aware. So now I try really hard with my own girls to make sure they have adequate sunscreen on and I even bought them sun hats specifically for sunny days at the beach. FUSN: What projects can we expect to see you in? LL: My film just came out on DVD called Moondance Alexander with Kay Panabaker. It’s a really sweet family film and I also have a Disney film coming out next year that’s starring John Travolta and Robin Williams called Old Dogs. FUSN: So it seems like you’re doing films that are more family oriented? LL: I guess I do gravitate towards things that focus more around family entertainment. I think there needs to be more quality family entertainment both in the feature film world and on television. I remember as a kid watching television with my family and it seems silly to say but I have really fond memories of us all sitting down and watching Happy Days and I really enjoyed it and my parents really enjoyed it because it was a time when they were kids. I just think there needs to be more television like that on the air. It’s also one of the reasons I think Dancing With The Stars and American Idol do so well because from little kids to grandparents, everybody can enjoy it and I think it’s important to have that quality of entertainment out there. FUSN: Do you vote for contestants on those shows? LL: (laughing) Why, yes I do. FUSN: And, do you only vote once? LL: Let’s just say the season Chris Daughtry was on American Idol I was voting like a maniac, I was speed dial voting.